Late last year RDT Pacific Central completed a project for Rotorua Lakes Council with a significant purpose – to revitalise the inner city. We are proud to report that 8 month’s one the project objectives are being realised. ‘Rotorua 2030’ is the vision of the Rotorua Lakes Council and involved seven major long-term goals that will renew the city. RDT Pacific acted as Project Managers for one of the top priorities – the inner-city revitalisation project which aimed to unlock the city centre’s potential, so it becomes a place where people will want to go. Following a number of years of declining retail, an increase in vacant buildings and changing trends in retailing, Rotorua’s inner city was no longer thriving where it was once the economic powerhouse of the district. Amongst the community, revitalisation had become the hot topic of discussion. The business community had banded together to say: “it’s time something was done.” Welcoming this show of unity from the business community, Rotorua Lakes Council joined the journey with a partnership approach to bring the heart and soul back to the city and to build the local inner-city economy back up to what it once was. The project was initiated with a vision setting exercise where retailers, visitors, workers and businesses told Council they wanted a vibrant city which cares about the environment, has a strong economy, supports the arts and connects its people to each other and the rest of the world. The high-profile project involved a streetscape redevelopment of the former Rotorua City Focus Site in the heart of the Rotorua CBD. 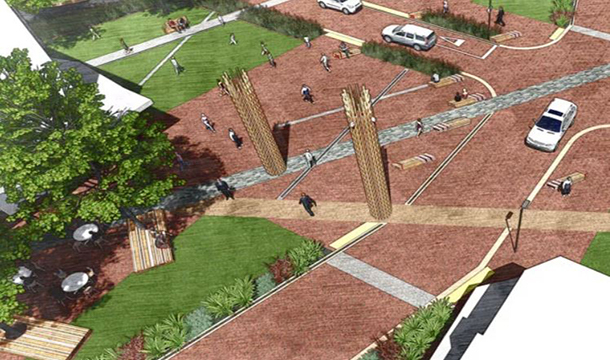 The brief for the project was to create a shared use space (the first of its kind in Rotorua) that accommodates pedestrians, cars, bikers and other users. Designed by Bespoke Landscape Architects the new look CBD includes improved spaces for cafes to extend seating, design elements that reflect the cultural significance of Te Arawa and the creation of a place with a focus on people, enabling them to gather, stop and enjoy the city. We undertook design value management, contractor procurement and construction management on a very difficult site as part of our scope. Sustainability is a core part of RDT Pacific’s business, so we were pleased to be able to incorporate sustainable aspects into this project with the use of wood. In April 2015, Rotorua Lakes Council adopted a Wood First Policy which recognises that Rotorua sits at the heart of New Zealand’s forestry and wood industry, and that approximately 40% of the country’s wood is harvested within 100 km of the inner city. The policy requires wood be used on all council projects, as such, an integral component of this project was the restoration and reinstatement of two old carvings of Hinemoa and Tutanekai and the creation of bespoke wooden street furniture. John Meredith and Megan Hill worked very closely with the Rotorua Lakes Council, the inner-city retailers, and a team of experts to enable this project to be delivered on time and on budget. We are pleased to report that since completion the central city retailers have noticed an increase in the pedestrian and vehicle numbers using the inner-city hub which was the ultimate goal of the project. The space has achieved putting people and associated social activities at the forefront, it has become a place people gravitate towards and socialise positively within, in the process generating improved commercial outcomes. RDT Pacific Central is committed to the future of Rotorua and as such are extremely proud to have worked on this project and continue our excellent relationship with Rotorua Lakes Council. We are thrilled with the result…there is nothing better than personally seeing the project objectives realised.